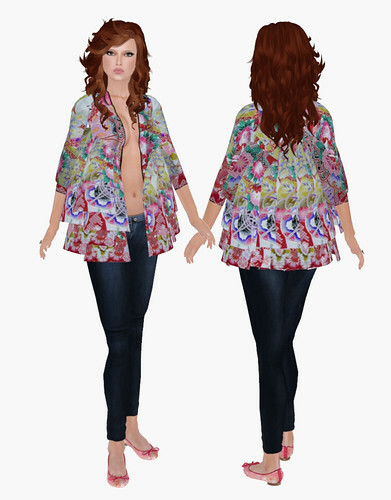 I’m currently obsessed with this Jacket Kimono from AWRAM-VIIE (by Miraiwave Iwish). Big shout out to KawaiiNicole for the great find! This Kimoni can be worn alone or as part of an outfit, you really can’t go wrong here. How cute are these two hairstyles Exile??? I’m in love with the two-tone colors sold only at TDR (The Dressing Room), go get ’em! Truth has three adorable new hairstyles! My personal favorite is the Rylan, which also has a Rylan 2 version (without bangs). I’m feeling kinda Red today.. do you like the change? I probably won’t ever be a permanent Red head in SL, but I do like to try it once in awhile. Hi, I’ve just discovered your website. It’s wonderful. And I love that jacket. Show haircolor variety more often, you can make any look good.